I don’t usually talk too much about Exchange unless it’s related to OCS, but this issue was a bit of a pain, so I wanted to share in case it can save anyone else some time. 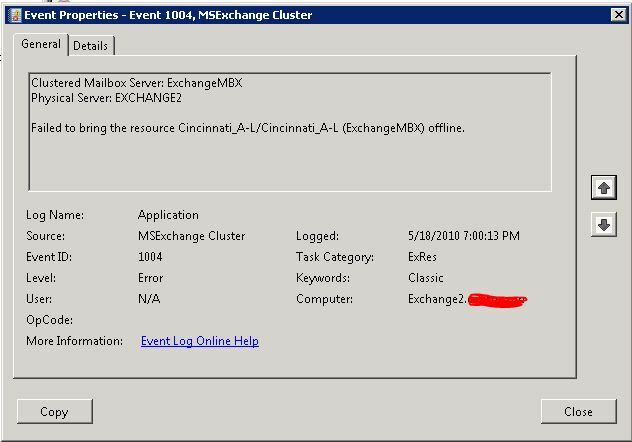 Today I received a call from a client who has a stretched Exchange 2007 CCR Cluster. After a failover in the cluster, they were unable to get re-seeding going on one of their storage groups. 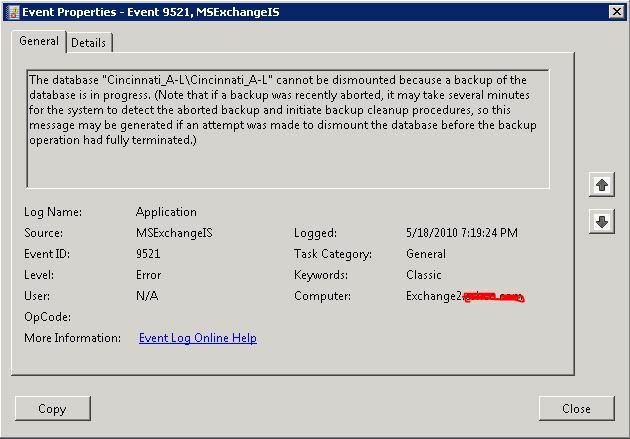 After a bit of troubleshooting I tried to use the “update-storagegroupcopy” but I was given a 2015 error that the command did not complete because “A database backup was already in progress”. I checked the backup server and found no backups in progress, so I figured the error was a phantom and tried manually removing all the files from the passive node and running the command again, same error. Next I hit a technet article on how to seed/re-seed (http://technet.microsoft.com/en-us/library/bb124706(EXCHG.80).aspx) but the automatic process failed. I decided to take the database offline to try a manual copy, but unfortunately, that failed as well. 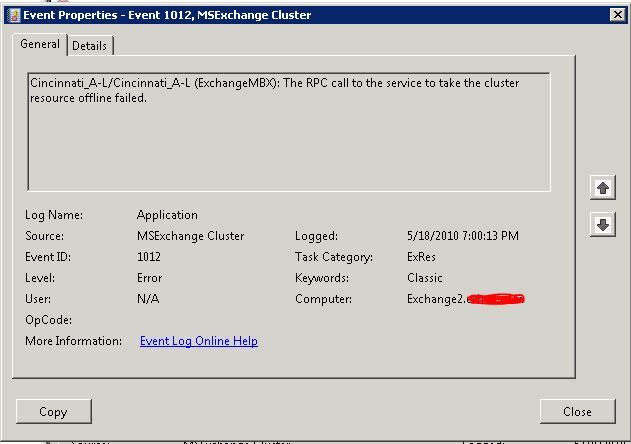 I did get 3 more errors this time, 2 related to the cluster resource failing to go offline and the third stating that a backup was in process. The error numbers were: 9521, 1012 and 1004. I pinged the customer on Communicator (I had to throw in something about OCS right!) and he informed they were testing a backup appliance that was taking block by block backups of the server. We disabled that agent as well, but still no joy. Since the errors were related to backups and no backups were running anymore, I went ahead and restarted the information store. After a restart of the information store I was able to run the “update-storagegroupcopy” command without an issue. My guess is the information store still thought one of the 2 backup applications were running. Problem solved. That’s all for the Exchange talk for this week, on the OCS front I’m quite busy in the lab with Wave 14 and a product I can’t talk about too much yet, code named SS (not a Microsoft thing). I’ll continue to write articles on the current products as they come up, but for now labbing is taking up my evenings. I do have some articles waiting on the 2 products above, but I can’t share as of yet. 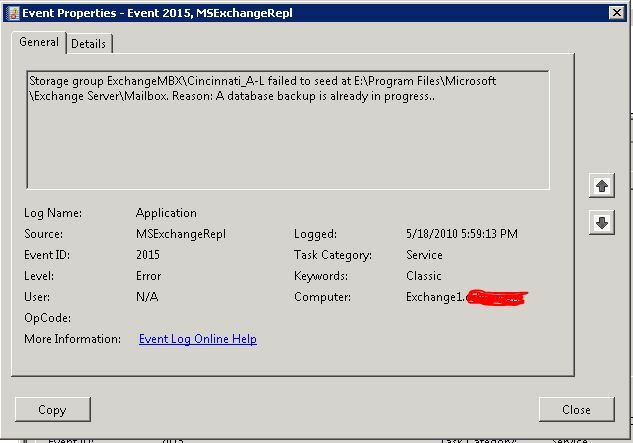 This entry was posted in Uncategorized and tagged CCR, Event ID 1004, Event ID 1012, Event ID 2015, Event ID 9521, Exchange 2007, Exchange Stretched Cluster, Storage Group Copy, storagegroupcopy, update-storagegroupcopy. Bookmark the permalink. i am a big fan of this blog. Please stick to the OCS thing only. Glad you like the blog, I try to stick to OCS but some times I run into things related to OCS that aren’t exactly OCS (or in this case, not that closely related at all) but I still want to share. I appreciate your feedback all the same and will do what I can to write about OCS any time I can.